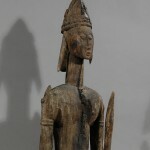 Bamana figures such as this were the focal point of celebrations of the Jo and Gwan initiation societies (associations of men and women) in several villages in southern Mali. Female elders among the Jo and Gwan leadership commissioned and cared for an entire series of allegorical figures belonging to their community. This work depicts an idealized male leader that would have been the companion to a similarly attired mother and child representation. Depending on a community’s resources, such ensembles also generally included additional male and female attendant figures engaged in a variety of activities. 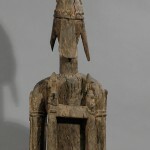 The specific gestures performed by the Jo and Gwan sculptures, which are not seen elsewhere in Bamana art, are descriptive of the supernatural protections and powers of elite Bamana leaders. The hat, adorned with depictions of animal horns and amulets, is a very important physical attribute of this particular sculpture. Additionally, the specific form of this hat identifies the figure as a hunter who possesses heightened powers of perception. The lance held in the hand of this figure appears as a depiction of a “weapon of distinction.” Such an object was handed down from father to son at the time of his initiation as a relic of heroic ancestors and to protect the youth in his time of greatest vulnerability. 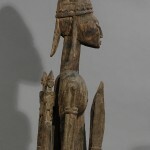 The knife held in the right hand has additional associations with hunting and is of the type frequently seen on older examples of Bamana sculpture, including terracottas dating as far back as the twelfth century. The heavily lidded eyes, closed mouth, and arms held close to the body suggest a sense of calm and self-possession, accentuating the stature and respect commanded by the figure. With its arched shoulders, curving facial features, rounded volumes, and underlying naturalism, this sculpture is a particularly graceful example of the Jo or Gwan style. 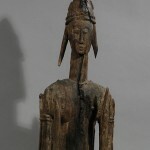 The work’s unusually good state of preservation, given its age, is the result of the extremely dry climate of southern Mali. Provenance: Belgian collection. 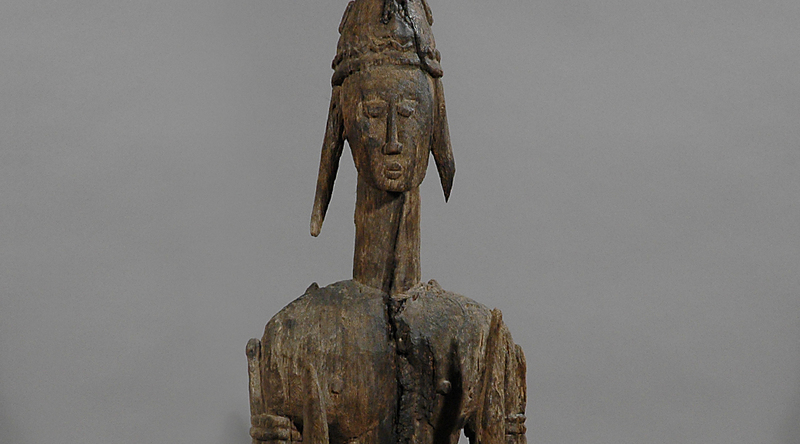 Collected in 1983 in Koulikoro region, 15th–20th century.